The Hana Ocean Palms Bungalow is located across from one of Hana’s most beautiful oceanfront pools – Waioka Pond (Venus Pool). The property is nestled in a coconut palm grove and surrounded by almost an acre of lush tropical flowers, fruit trees and bamboo. Pick avocados, papayas and bananas before heading to some of the best beaches on Maui. 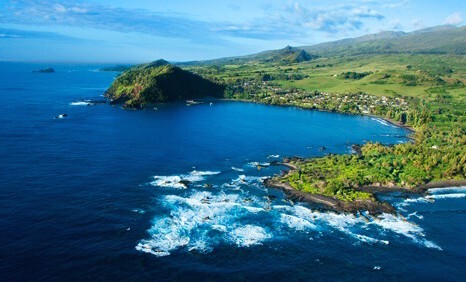 We are located about one mile from both Hamoa and Koki Beach, three miles from Hana town, and eight miles from Haleakala National Park (Kipahulu District). This charming bungalow has all the comforts of home including a fully equipped kitchen, a gas grill for barbecuing, high speed internet access, and a phone for local or long distance calls. The master bedroom has a queen bed and the back bedroom has one double, and one twin bed. The bungalow has two screened porches, one with a hammock for an afternoon nap, and the other with a queen bed looking out to the ocean. Fall asleep listening to the sea from the screened porch and awaken to the sound of the wind in the palms and birds singing. Original oil paintings by a local artist, warm natural cedar wood and bamboo, luxurious rugs and bedding throughout.